Arabtec Holding, a leading construction company in the Middle East region, has registered a net profit attributable to the parent of Dh181 million ($49.2 million) for the third quarter, growing more than twofold from last year's figures of Dh75 million ($20.4 million). Announcing the results for the first nine months ending September 30, Arabtec Holding said its revenue for the period grew higher, by 12.7 per cent, from Dh6.3 billion to hit Dh7.15 billion. 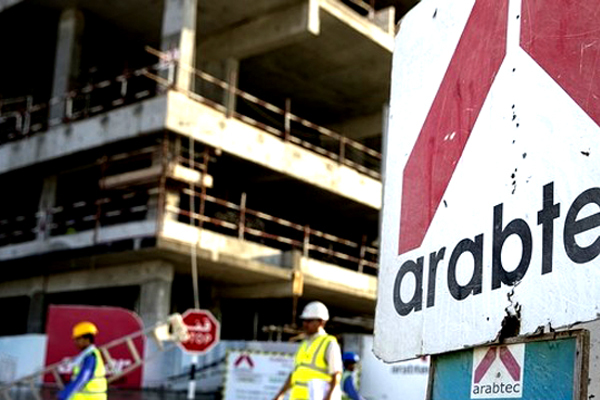 A leading Dubai-based contractor for social and economic infrastructure, Arabtec said its Q3 debtor days got reduced by a further two days to 166 days contributing to a positive net cash from operating activities of Dh193 million. The group’s backlog increased to Dh16.4 billion, reflecting its increasing focus on social and economic infrastructure and industrial sectors. Backlog is supported by a strong Dh45.8 billion pipeline of identified opportunities within Arabtec’s addressable market, said the top builder. Moving towards 2019, Arabtec continues to simplify the business through standardised processes and enabling tools and the removal of duplicated functions and activities through shared services and outsourcing. It continues to review non-core assets which are not considered key to the business for divestment or development. Moelis & Co have recently been appointed to advise and assist Arabtec with debt financial modelling, structuring options and engagement with finance providers. On the solid performance, Group CEO Hamish Tyrwhitt said: "I am pleased to report another positive quarter of results. Debtors days are continuing to decrease through our efforts to close out completed projects and shorten the payment cycle for current projects. This has contributed to a further improvement in cash from operations and an Dh146 million reduction in net debt. Strengthening the balance sheet remains a strategic priority going into 2019." "The Dh3.2 billion award by Adnoc LNG to Target Engineering and Tecnicas Reunidas and further infrastructure work awarded to Arabtec Engineering Services highlights our progress in building a stronger presence in the infrastructure and industrial sectors," stated Tyrwhitt.